I had read The Death and Life of Superman before. But after seeing the Justice League Unlimited episode "Hereafter" where the world (and the Justice League) has to move on after Superman's funeral, I wanted to read it again. The novelized version of the comic book has three sections, mirroring the comic books: Doomsday, Funeral For a Friend and Reign of the Supermen. After a brief telling (mostly through memories) of Superman's history, we learn that Clark has proposed to Lois (she said yes) and he told her his secret. While giving a rare interview, Superman learns that the Justice League is fighting (and losing to) a huge villian: Doomsday. He abruptly leaves the interview to join the battle. Doomsday seems unbeatable. He almost effortlessly defeats the Justice League and is giving Superman the fight of his life. Superman realizes that the normal limits he places on himself (to prevent killing) is preventing him from defeating Doomsday, so he starts to fight full force. After a long battle, Superman gives everything he has to defeat Doomsday. And the unthinkable happens... He dies. In Lois's arms. 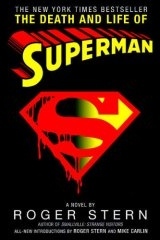 Superman is dead. Funeral For a Friend begins with an elaborate funeral. The Justice League, Wonder Woman, Batman and many other DC heroes are there. But the crux of the story is how those close to Superman deal with his passing. This part of the story is extermely emotional. Lois, Martha & Jonathan and Lana Lang's struggle to cope really pulls at your heart. Not only is Superman dead, but Clark Kent is missing (investigating for a story and supposedly lost in the path of destruction caused by Doomsday). I can't say enough how emotionally charged this part of the story is. It's a fantastic read. Reign of the Supermen tells of four Supermen that descend on Metropolis. Cyborg, The Man of Tomorrow, looks like Superman except that several parts of his body (including half of his head and one of his arms) are robotic (using Kryptonian metal). He has many of Superman's memories and seemingly all of his powers. But something seems a bit off. The Last Son of Kryton also looks like Superman, but is powered by energy. When he awakes, he realizes his eyes are sensitive to light, causing him to wear a visor. He can also shoot blasts of energy. Superboy is a clone of Superman that escaped before he was fully trained and fully grown by his Cadmus creators. Since his creators didn't have a cellular sample from Superman (couldn't get one), Superboy doesn't have all of Superman's powers and he has powers that Superman didn't have. Given his youth and lack of training (and lack of a Kent-background), he's very cocky and reckless. Finally, The Man of Steel (or just Steel) is John Henry Irons. He was once saved by Superman and creates a super suit that allows him to fight crime in Superman's honor. Cyborg and The Last Son of Krypton each claim to be the "real" Superman. But after meeting them, Lois is not sure. Something seems off. Neither seem to have Superman's heart. Cyborg claims to have amnesia and the energy Superman tells Lois that he is only Superman now, Clark is dead. Which is the real Superman? During a battle with a new villian, Mogul, we learn who the real Superman is. This book is great! My favorite part is the telling of how others dealt with losing Superman and Clark. The battles are descriptive and action packed. I highly recommend it, whether in comic book or novel form. Wikipedia has a descriptive article about the story and includes spoilers.